Fun at Somerset House. 55 of these fountains dance and tease in the courtyard. The building itself is huge. The palace of the Duke of Somerset built in the 1500's. Since the 1800's, thanks to King Georg III the home of the Royal academy of arts.It was also from around this time the place the general register office. A place where certificates of births, deaths and marriages could be found. Until they moved out in 1970. Brief posts will appear over Easter while I am away exploring other parts of the UK. These kinds of fountains seem to get popular all over; even nicer during hot summer days! Wonderfull capture of water having fun! You have a great time exploring. I love all the history you give us with each beautiful pic. Enjoy your travels. You do give us a lot of history and the pictures are great! Thank you! Hope you have a lovely time! definitely a fun photo for today. Happy Easter. I am glad you enjoyed the cactus and Chihuly on my site. I agree that I could have take many more photos of this bizarre saguaro cactus. I will have more Chihuly and cactus coming up and a tour of Frank Lloyd Wright's Taliesin West over the next few weeks. I hope you like the Wright series about his historic desert camp. Cool water shot. I like the added hoody too! Lol! Enjoy your adventure. Somerset House also host concerts and outdoor plays in the summer - its very much keeping with its history as beign part of the community. I love Somerset House! 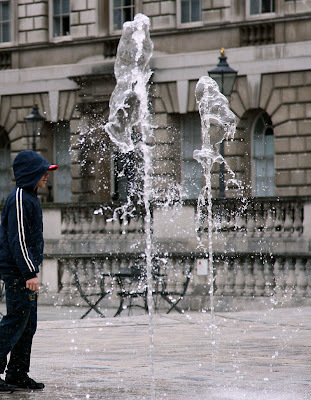 I go to summer school at Courtauld and ran through the fountain quite a few times on hot days. Great timing on both the water spray and the boy. Funny title too which all comes together nicely.